Womens New Look Size 6 Chelsea Ankle Boots. Tried on in the house but never worn outside. Excellent condition. The colour is a kind of sludgy brown faux suede. Dispatched with Royal Mail 2nd Class. Boots are in excellent clean condition inside and out. 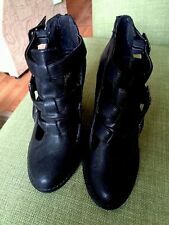 New Look Size 6 Wedge Grey Mid Combat Biker Boots fab condition only been worn once as you can see by the photos ! Size: UK 7/ EU 40. Upper Material: Synthetic. Sole: Gum Rubber. Metal bar faux leather ankle boots the shoes are brand new with tags but there are few tiny scuffs on them hardly noticeable at all . Please note I don't accept returns ! Leather Cowboy Boots 🍒. 100% Light Tan Leather. Generous Boot opening to fit all size Calves. Boot Top to Sole~13.5"ins. New look Mustard ankle boots size 9. Dispatched with Royal Mail Signed For® 2nd Class. Full length side zip for easy foot access. Black leather upper. Pre loved New Look Ankle Boots Size 5 Wide Fit. Lace up fastening with buckle detail to outside. Suede look material with platform style sole. 4 inch heels. Excellent condition from a non smoking no pet household. Fab print boots from New Look bought on Asos. NEW LOOK.TAN SUEDE ANKLE BOOTS. SZ 7 UK.40 EU. HARDLY WORN.IN VERY GOOD, CLEAN CONDITION. 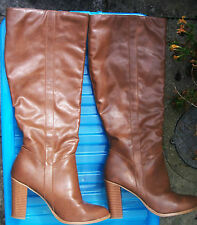 Ladies Tan Ankle Boots By NEW LOOK SIZE 6. Condition is Used. Dispatched with Royal Mail Signed For® 2nd Class. Ankle Boots. Circumference of Top of Boot - n/a. Heel Type - Block. Heel Height - 3.75". Lovely boots with very little wear. Size UK 6 EU 39. Sole - Rubber. Width of Sole at Widest Point - 9 cm. Ladies Cowboy Style Tan Boots size 6 used. 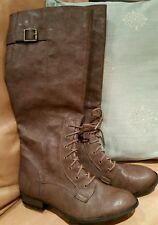 New Look Ankle Boots Bnwt Size 9 . Dispatched with Royal Mail Signed For® 2nd Class. Stunning New Look Size 4 Ankle Boots Peep Toe Women’s Shoes. Condition is Used. Dispatched with Royal Mail 1st Class. Materials - Upper- Synthetic. Sole - Rubber. See Photo. ( see the condition on the photo). Check my other item for sale! LADIES TAN COWBOY STYLE BOOTS. May have minor marks on them. 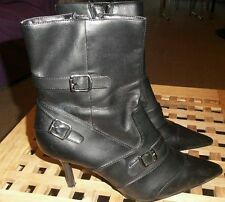 women black ankle boots size 5,New look very good condition . Condition is Used. Dispatched with Royal Mail 2nd Class. Women Black Knee High Boots With Zip Detail. Dispatched with Royal Mail 2nd Class. Condition is Used. Boot have a few small scuffs. Really nice boots with wide calf fit. Black leather upper. Full length side zip for easy foot access. New Look Tan Brown Ankle Boots Chunky Heel Size 7. Really Good Used Condition. Around middle boot 14.5”. Total boot height 27 ” at back and longer front about 29.5”. Around top boot 20”. Heel height 4.5”. In good condition as per pictures, worn ones. Ladies Light Brown Shoe Boots Size 3. Condition is Used. Dispatched with Royal Mail 2nd Class. Materials - Upper- Faux Suede. This is used,but in good condition. See Photo. ( see the condition on the photo). Size -U.K- 5. Check my other item for sale! Ladies New Look ankle boots. chunky platform & heel. Dress like you're back in the 70's with these block heel, knee height boots. Sole: Gum Rubber. Ladies size 7 black and grey tartan fold over ankle boots by New Look. RRP £29.99. Leather with full length zip. New Look burgundy patent chunky lace up ankle boots with buckle strap detail to the back. Platform sole with chunky heel. Black Ankle Boots Size 5 38 New Look Heel Block Elastic Chelsie Boot Leather. heel 3 1/2 “ In good condition heels slightly worn and scratched see photos. Dispatched with Royal Mail 2nd Class. Black Suedette Panel Chain Back Ankle Boots. Give a subtle edge to your look with these chain trim boots. Ladies NEW LOOK. Black Lace Up Ankle Boots with Chucky heel- Size 5. Condition is Used. Dispatched with Royal Mail 2nd Class. Newlook Size 7 Black Patent Boots Good Used Condition. Ladies Size 7 NEW LOOK brand New Black Boots. Slip On & Stylish. Block heel.